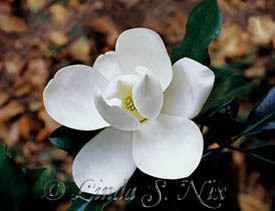 An Elegant image with a perfect shape, just like the legendary movie star. 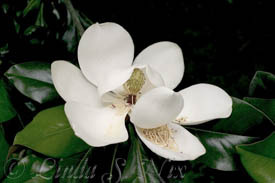 A Brown Bracken Magnolia (Little Gem variety) caught as the first bloom of a young magnolia cultivar. 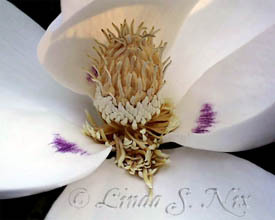 The center has a rusty red stamen. stage play where it had its debut. 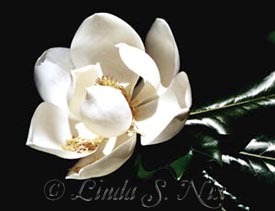 A magnolia dropout on white background containing with subtle hints of pastel colors suitable for framing or using on printed brochures, wedding invitations, or other printed matter. 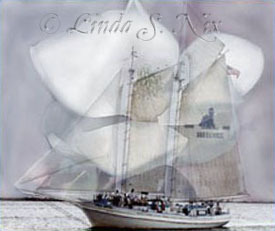 "Once Upon a Time on the Sound"
This image depicts a Biloxi Schooner from bygone days that takes us back to a time when the Mississippi Sound was filled with sailing schooners and magnolias were (and still are) the romantic flower of the South. Also available in Sepia Tones. 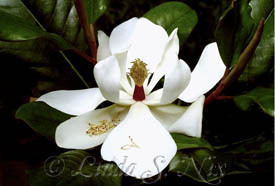 Close-up of a Big-Leaf Magnolia showing the touches of magenta on the tepals. 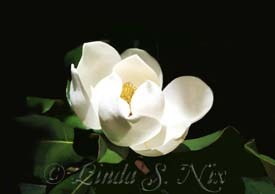 This image truly does epitomize the magnificence of the Magnolia. 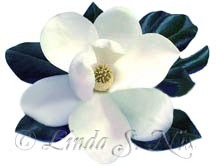 This image does the magnolia justice. The nuance of color around the ruby-red receptical sets off the almost perfect blossom. 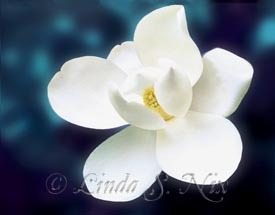 Digital Image on a sapphire background of muted foliage. 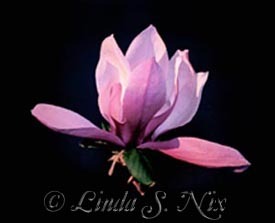 A dreamy scene of an opening magnolia bud with sunlight captured as tiny amethyst jewels surrounding the blossom. 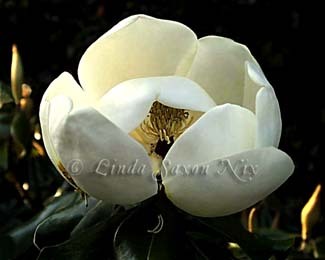 Pristine blossom against emerald green foliage. 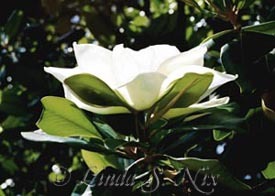 Caught as the sun illuminated the blossom and leaves on an unusual upright branch. 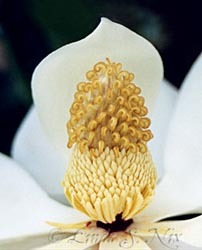 The leaves are young, allowing a translucent base for the flower. 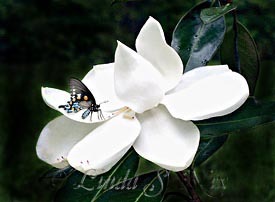 A "Little Gem" with a butterfly on its tepal. 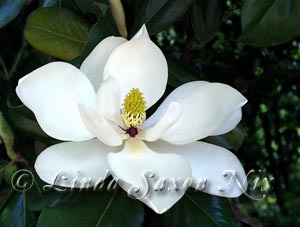 Buttercup center on this nearly perfect magnolia. 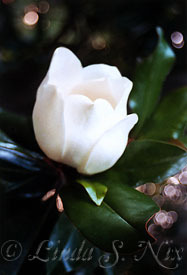 This image is available as a 35mm image and a digital image. Raindrops sit on the tepals and the leaves are a crisp, bright green. 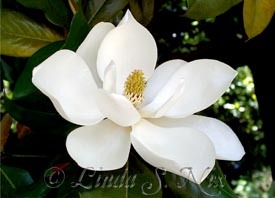 Center of a perfect magnolia. It is a perfect jewel center. Captured as the sun was slanting on the blossom, while the background was in the shade. Almost a vignette. 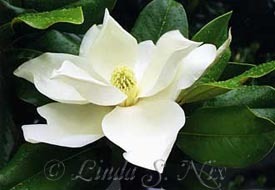 a scepter; the tepals stand out in good symmetry. Actual image is more colorful.The background has autumn tones; the actual colors are brighter. 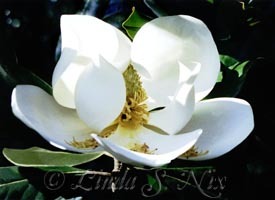 Basked in the golden setting sun, this magnolia looks as if it has warm candles illuminating it and the golden-lit center. One of my first "classical" images. 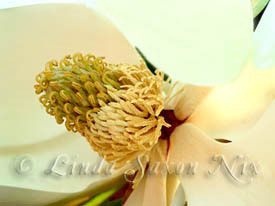 Center of a magnolia follicle with delicate shades of golds and greens. specific needs upon stipulation in their contract. backgrounds, special borders, and, of course, custom sizing. Page Revised & Updated May 2, 2006. 4/10/10..